Episode 10 of myrtle beach TV took us to The Clubhouse in Myrtle Beach to watch the Old Scobes perform and be interviewed by Chris Ward. We also headed over to the FOX TV studio on the south end of Myrtle Beach to film behind the scenes of the show Not the News, starring Greg Rowles and Alix Michaels. While there, Warren talked with Dave Milligan, producer of Not the News, about the people behind the show, and those involved in its production. Bill Norman talked with Holly Kaufman for the giving back segment about the humane society's local presence. We captured the ceremonial ground-breaking, and the locals who attended, at the Vereen Gardens Community Center in Little River, a project 15 years in the making. Viewers were introduced to two new web-only shows currently in production, littlerivertv.com and northmyrtletv.com. Both shows will be launching in the near future. 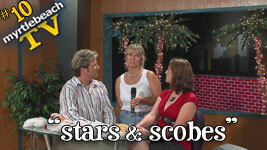 Watch episode 10, "stars & scobes" online now.